What's the used Audi A7 hatchback like? Filling a hole neatly between the smartly executive Audi A6 saloon and the distinctly upmarket Audi A8 saloon is the Audi A7 Sportback, an executive car that appears, at least in its rakish styling and frameless doors, to be a low-roofed five-door coupe. It is based on the A6 in much the same way that the similarly styled but smaller Audi A5 Sportback is based on the A4 saloon, borrowing an idea used to good effect by the likes of Mercedes-Benz with its CLS and BMW with its 4 and 6 Series Gran Coupes. What you get, in the case of the A7, is a very smart and beautifully finished premium car of distinctive looks and one that contains all the usual Audi qualities. 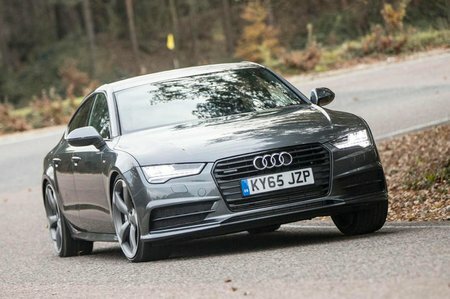 The A7 range is actually relatively compact, consisting of a trio of V6 diesels – a 215bhp, a 268bhp and a 315bhp bi-turbo version, all offered in either SE Executive, S-line and Black Edition trims. There are also three performance models from Audi Sport all using the firm’s favourite twin-turbocharged 4.0-litre V8 engine - the S7, RS7 and RS7 Performance. All engine options push the A7 around with great pace and laudable refinement, helped out in all but the high-performance models by a standard seven-speed dual-clutch gearbox. This punchy performance is all the more remarkable given the car’s surprising heft, which in itself is a bit of a disappointment as a good proportion of the car is actually made of weight-saving aluminium. However, there are no such disappointments when it comes to the ride and handling, as the low-slung Audi offers a genuinely comfortable and plaint ride, whether on its standard steel spring suspension or on the optional air suspension. All A7s, with the exception of the eco-focussed ‘Ultra’ version, come with four-wheel drive, and there’s plenty of grip available in most situations, as well as a rear-biased power split that makes the car feel nicely balanced in corners taken quickly. 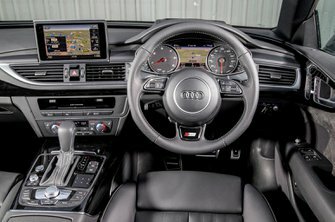 The high-quality interior’s sculpture, craftsmanship and trimmings are all up to, and in some ways beyond, the usual Audi standards. It’s beautifully constructed, and the dash and all the major controls are well placed and look and feel uparket. This is a long, low car, but there’s plenty of space for rear passengers, providing they’re not too lanky, otherwise they might feel their heads brushing the rooflining. So the A7 may seem a bit like a niche product, but it’s also a truly impressive and very well-made luxury car. Find a good used one and you’ll be impressing the neighbours for several years to come.